Will Trump administration, law enforcement challenge safe injection site plans? 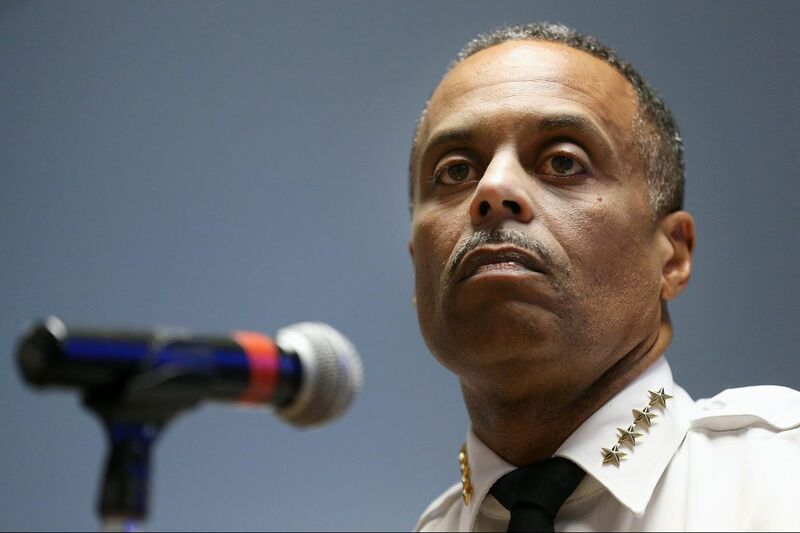 Philadelphia Police Commissioner Richard Ross listens to a question Tuesday during a news conference in the Municipal Services Building announcing the city’s support of opening a safe-injection site. A key question remained unanswered Tuesday after Philadelphia's announcement that it will support the opening of a safe injection site: How will law enforcement react to a policy described by detractors as an acceptance of illegal drug use? Local officials, from the city's police commissioner and district attorney to the state attorney general, offered varying reactions to the news, from a full-throated endorsement to hesitance about whether the sites could operate legally. The Justice Department and U.S. Attorney's Office in Philadelphia offered no response at all — although a local spokesman for the Drug Enforcement Administration said, "This is not a measure that we can support or condone." Officials and experts said federal agencies would play a powerful role in determining whether the site will be allowed to operate and what consequences the city might face for supporting an idea backed by public health advocates. "We don't know how the Justice Department would react," said Leo Beletsky, professor of law and health science at Northeastern University in Boston. "We can only surmise from the current attorney general's stance on other issues – specifically marijuana – that his take on states' rights is not the same as the previous administration." Attorney General Jeff Sessions has proven himself to be a staunch advocate for a renewed war against drug use, but the Justice Department under President Trump has yet to take an official position on safe injection sites, even as several cities — including Seattle and San Francisco — have inched toward proposals similar to Philadelphia's. The Justice Department did not respond to a request for comment Tuesday, but Patrick Trainor, spokesman for the DEA's Philadelphia division, said the proposal "has got the attention of a lot of high-ranking people" in Washington. He declined to answer specific questions on how the DEA might react to the opening of such a facility. Last month in Vermont, where state officials are exploring a similar policy, U.S. Attorney Christina Nolan, a Trump appointee, threatened to prosecute those involved with a site and to seize the facility's assets. "The proposed government-sanctioned sites would encourage and normalize heroin use, thereby increasing demand for opiates," she wrote. "It is a crime, not only to use illicit narcotics, but to manage and maintain sites on which such drugs are used and distributed." Sessions last month also took steps to roll back Obama-era policies that had let federal law enforcement effectively look the other way as states set their own laws regarding marijuana legalization. And the Trump administration has punched back against cities that have bucked its policy goals – including Philadelphia, where it sought to revoke federal law enforcement grants in response to the city's "sanctuary city" policy on illegal immigration. Brian Abernathy, Philadelphia's first deputy managing director, said the city would work with potential partners to stem any federal consequences. "We're confident and hopeful that the federal government has more important things to do than to not save people's lives," Abernathy said. Local officials said the potential to reduce the skyrocketing number of overdose fatalities was a key factor in getting them to consider the proposal. Studies also suggest that safe injection sites in Vancouver, Sydney, and other cities have helped prevent overdose deaths while having little impact on public safety. Police Commissioner Richard Ross said a conversation last fall with a police leader from Vancouver convinced him the sites could help save lives — even though he still has questions about how Philadelphia police would interact with such a facility and patrol near a site where illegal drug use is sanctioned. "I went from being adamantly against it to having an open mind," Ross said Tuesday. New District Attorney Larry Krasner also pledged that his office would not target the operators or users at a safe injection site. "No, I would not seek prosecution for people suffering from the disease of addiction and trying to deal with that and stay alive long enough to be rehabilitated in a safe way," Krasner said. State Attorney General Josh Shapiro, however, said sanctioning a safe injection site "presents significant public safety concerns, and changes in state and federal law would need to occur for these sites to operate legally." In a statement Tuesday, Shapiro stopped short of addressing the key question of whether his office's agents would turn a blind eye to such a center. Other state officials noted that Pennsylvania's crime code prohibits possessing or injecting controlled illegal substances or possessing drug paraphernalia. The city's proposal does risk running afoul of two federal laws — a statute barring illegal drug possession and one known as the Crack House Statute, which makes it illegal to "knowingly open or maintain … [or] manage or control any place … for the purpose of unlawfully … using a controlled substance." The DEA rarely pursues cases of personal-use drug possession, focusing instead on traffickers and large-level dealers. How the Justice Department might view a safe injection site under the second law is "more of a question of politics or optics" than a legal one, said Corey S. Davis, deputy director of the Network for Public Health Law. "At any one time there are a million priorities," he said. "Each agency has discretion on what types of cases they want to pursue." Still, a disconnect between federal and local law enforcement can present situations ripe for confusion. When Vancouver opened a safe injection site in 2003, for example, the Canadian government established a legal exemption allowing people to use illegal substances at the site, according to the head of the police union, Tom Stamatakis. But Stamatakis said Tuesday that it was still illegal to buy or sell the drugs, and dozens of police officers were deployed to the neighborhood of the safe injection site to help prevent increases in petty or drug-related crimes. "There are issues there you have to carefully consider," he said.